Coming up in January 2017 is the next unjuried Promenade Arteast exhibition. There is no theme for this show. We wish to showcase the wide variety of artwork that members produce. Janvier 2017, est la prochaine exposition sans jury de la Promenade Arteast. Une oeuvre par artiste peut être présentée : ( dimension maximale d’une pièce incluant le cadre : largeur 38 pouces par hauteur 72 pouces ). L’exposition n’a pas de thème. Nous désirons présenter une grande variété d’œuvres produites par les membres. Si trop de tableaux sont soumis pour une seule exposition, les noms sont retenus selon la date de réception du libellé postal, pour une exposition subséquente. Les membres sont informés s’ils participent à l’exposition affichée ou à une subséquente. Les participants doivent apporter leur formulaire dûment complété, signé, avec leur œuvre, le jour d’échange indiqué. Les participants doivent être membres réguliers ou doivent s’inscrire. Les frais d’accrochage sont de $5 pièce. Nous sommes à la recherche parmi nos membres, des bénévoles pour nous aider l’ors de BazArt( événement artistique des fêtes) au Centre des Arts Shenkman. Nous recherchons des artistes pour 1 heure ou plus, afin de démontrer leurs talents artistiques. Cet évènement se passera durant la fin semaine du samedi, le 26 novembre de 11h à 16h ainsi que dimanche, le 27 novembre de 11h à 16h. Si vous êtes intéressé veuillez envoyer un courriel josiedemeo@bell.net ou téléphoner Josie De Meo au 613-590-7627 avant vendredi le 14 novembre. Vous avez aussi la possibilité d’apporter une de vos création, étant donner l’espace limité la grandeur maximale sera de 11 x 14. We are looking for members to participate at BazArt (Holiday art event) at the Shenkman Art Center. We are looking for members to demonstrate their artistic talents for 1 hour or more. BazArt is during the weekend of, Saturday, November 26th 11am to 4pm and Sunday, November 27th from 11am to 4pm. Please email josiedemeo@bell.net or contact Josie De Meo at 613-590-7627 before Friday, November 14th. You will also be able to display one small artwork, being we have limited space 11 x 14 is the maximum size. 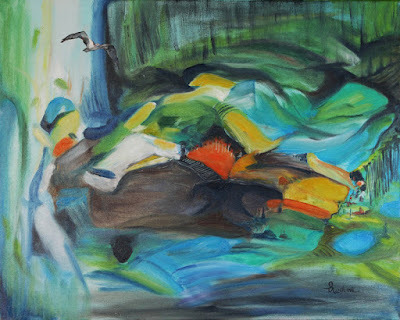 The Legal Information Centre in conjunction with Arteast is proud to present an exhibition of paintings by Rashmi Rekha. This solo show entitled, “The Kaleidoscope of Life” runs from October 28, 2016 – April 28,2017. This show will present the beauty and magic of thinking of life as a kaleidoscope. Rashmi is passionate about exploring different perspectives on life and modern society and present them in colourful images on my canvas. She takes the images of today’s social and natural landscape and her personal experiences, the good, the bad, and even the ugly and shuffles the pieces together to create a visually appealing image using a wide range of colours, singularly unique and precious because we understand that the slightest shift can quickly change the picture. Each of these paintings will keep the viewer engaged. These paintings are in oil or acrylic mediums. This is a unique opportunity for the public to enjoy, encourage and support local artists in their community as well as engaging with the Legal Information Centre. Location : Legal Information Centre, 85 Albert St, 14th floor, Suite 1400. Hours: Mon. afternoon, 1-4pm; Tues- Thurs. 10 – 4pm. Friday 10 – noon. Closed Sat.,Sunday. Kerstin Peters is truly an all around artist, whether working in her studio on animal portraits or out with a plein air group enjoying the beautiful landscape. These plein air adventures have taken her all over Canada. 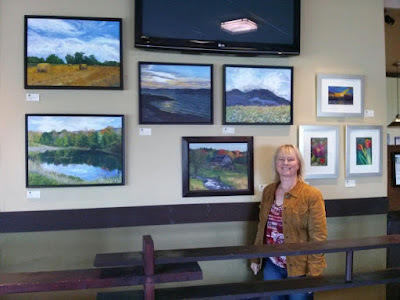 As a member of several art organizations, she exhibits her work regularly and “hopes to inspire others to find and express their own creativity”. Kerstin sees art as a ”means to relax, have fun, grow and connect with others through the process of creating”. She believes that “everyone can express themselves through art”. Acting on this belief, Kerstin offers courses, workshops and paint parties, working with both adults and children. 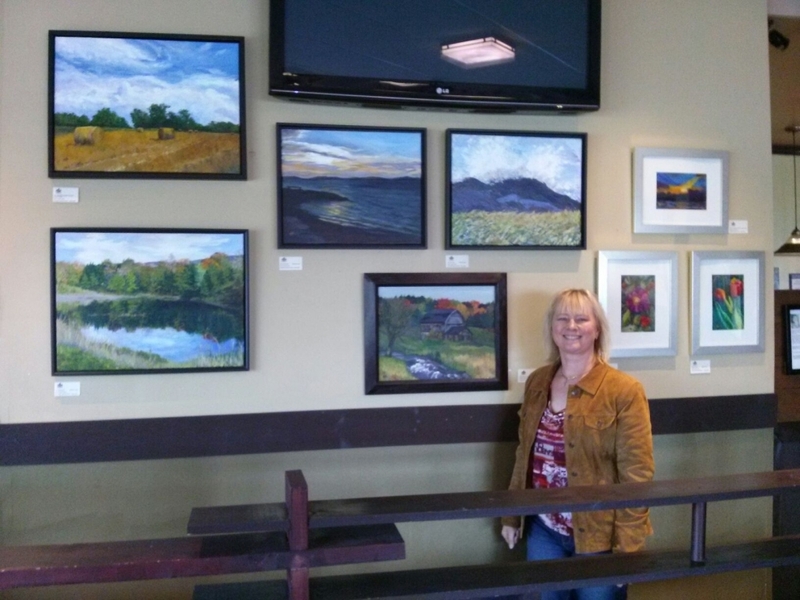 Several of Kerstin’s landscapes are now on display at Luna Sole, along with three colourful pieces of her fiber art. The show will be on until December 6th. Christine Gendron is inviting you and your guests to (shop for christmas / parties) attend an open house where Christine will be selling her original artwork, and Colours will be selling jewellery (designed and hand-crafted by Christine). The jewellery will be for sale at 50% off the ticketed price. DATE: Every Saturday in November (5, 12, 19, 26). Private appointments can be arranged for another day or an evening in November by contacting Christine at 613-824-4790 or by email at christinegendron@sympatico.ca.